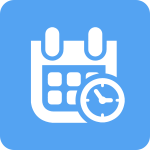 If you are trying to do this for a particular day in Zip Schedules, what you will do is start at your main schedule page and using the date range selection right above the employee tab, you will select the week range you would like to block off time for. Once you select the correct range, next to each day you will see a little pin icon, if you select that pin icon and go to the tab marked OPTIONS it will have the ability for you to turn off time off requests for the day you choose. Can an employee request for time off?